Search and adopt a Italian Greyhound near you. The name of the breed is of reference to the breed's popularity in Renaissance Italy. Mummified dogs similar to the Italian Greyhound (or small Greyhounds) have been found in Egypt, and pictorials of small Greyhounds have been found in Pompeii. They were probably the only accepted companion-dog there. As an amusing side the expression 'Cave Canem' (Beware of the dog) was a warning to visitors, not that the dogs would attack but to beware of damaging, tripping over or stepping on the small dogs. Although the small dogs are mainly for companionship, they have in fact been used for hunting purposes, often in combination with hunting falcons, rat or mice. The Italian Greyhound is the smallest of the gaze hounds (dogs that hunt by sight). The breed is an old one believed to have originated more than 4,000 years ago in the countries now known as Greece and Turkey. This belief is based on the depiction of miniature greyhounds in the early decorative arts of these countries and on the archaeological discovery of small greyhound skeletons. By the Middle Ages, the breed had become distributed throughout Southern Europe and was later a favorite of the Italians of the sixteenth century, among whom miniature dogs were in great demand. Sadly, though, 'designer' breeders tried, and failed, to make the breed even smaller by crossbreeding it with other breeds of dogs. This only lead to mutations with deformed skulls, bulging eyes and dental problems. The original Italian Greyhound had almost disappeared when groups of breeders got together and managed to return the breed to normal. From this period onward the history of the breed can be fairly well traced as it spread through Europe, arriving in England in the seventeenth century. 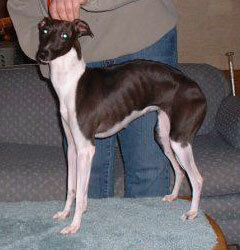 The Italian Greyhound is the smallest of the sighthounds, typically weighing 8 to 15 lbs. (3.6 to 6.8 kg) and standing around 13 to 15 inches (33 - 38 cm) tall at the withers. Though they are in the "toy" group based on their weight, they are larger than other dogs in the category due to their slender bodies, so owners be aware when sizing clothing or accommodations. The Italian Greyhound's chest is deep, with a tucked up abdomen, long slender legs and a long neck that tapers to a small head. The face is long and pointed, much like a full sized greyhound. Overall, they look like "miniature" Greyhounds, though there is dispute in the use of the term "miniature Greyhound", in reference to the breed itself. By definition of the American Kennel Club - they are true genetic greyhounds, with a bloodline extending back over 2000 years. Their small stature is a function of selective breeding. Their gait is distinctive, high stepping and free, rather like that of a horse. They are able to run at top speed of up to 25mph (40 km/h) with a double suspension gallop! The modern Italian Greyhound's appearance is a result of breeders throughout Europe. Austrian, German, Italian, French and British breeders, have all made great contributions to the forming of this breed. The Italian Greyhound should resemble a small Greyhound, or rather a Sloughi, though they are in appearance more elegant and graceful. The Italian Greyhound is very affectionate and makes a good companion dog. The breed is great for families and enjoys the company of people. While they are excellent with children, the breed's slender build and short coat make them somewhat fragile, and injury can result from rough play. The breed is equally at home in the country or the city. They are agile, fast and athletic. Daily exercise is a must for a happier, well-adjusted pet. The Italian Greyhound loves to run. The younger dog is often very active, and this high level of activity may lead them to attempt ill-advised feats of athleticism that can result in injury. They enjoy running as fast as they possibly can, typically faster than other larger dogs. In general the Italian Greyhound is intelligent, but they often have a "what's in it for me" attitude and do not exactly throw themselves into training with great enthusiasm, so patience, firmness, gentleness, and reward in training seem to work best. They are also known for mischievous ingenuity; despite a high center of gravity, they can easily walk upright on their hind legs to reach items up on tables. Italian Greyhounds make reasonably good watchdogs, as they will bark at unfamiliar sounds. They will also bark at passers-by and other animals. They often get along well with other dogs and cats they are raised with. They should not be considered "true" guard dogs as they are often aloof with strangers and easily spooked to run. Due to their slender build and extremely short coat, Italian Greyhounds are at times reluctant to go outside in cold or wet weather, so some owners lay old newspaper on the floor near an exit so their pets can relieve themselves. Some will respond to dog-litter training as well. This breed tends to gravitate to warm places, curl up with other dogs or humans, or burrow into blankets and under cushions for warmth. Italian Greyhounds instinctively hunt by sight and have an extremely high predator drive. Italian Greyhound owners typically keep their dogs leashed at all times when not in an enclosed area to avoid the risk of even a well-behaved pet breaking away at high speed after a small animal. A short leash is highly suggested to owners due to reports of animals breaking their own necks when running a full lead mounted to the ground or a wall. A dog harness is a good option; since the IG has a tapering neck and small head, they can often "slip" their collar and leash. This can also be used to avoid the above-mentioned neck injury ,it also gives the dog the freedom of a long leash. Owners of Italian Greyhounds should be mindful of any unknown dogs, no matter what size, because Italian Greyhounds can be territorial, and may even "have a go" at any larger unknown dogs on their property. Dogs of this breed have an extremely short and almost odorless coat that requires little more than an occasional bath, but a wipe-down with a damp cloth after walks is recommended as seeds, burrs and floating dust in the air can get into the coat and irritate the skin. Shedding is typical as of other breeds, but the hair that is shed is very short and fine and is easily vacuumed. The teeth of an Italian Greyhound should be brushed on a daily basis. Their scissor-bite and thin jaw bone make them susceptible to periodontal disease, which can be avoided with good dental care. Responsible breeders will routinely check their dogs for the onset of various inherited disorders.